As Americans we love fried food. From French fries to fried turkeys, it seems everything tastes better when it is dipped in a little grease. Deep fryers have been on the market for many years, but many brands are clunky, heavy and even a little dangerous. When it comes to the business of handling hot grease, finding products that have safety and ease of cleaning in mind are worth the money. We have evaluated the deep fryers available on the market today and have selected a few that we feel are the best in the business. 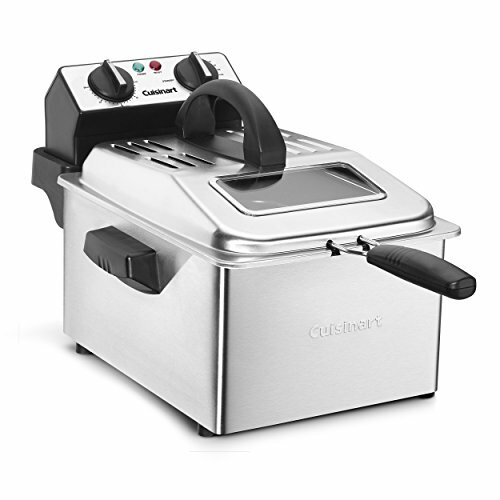 The Cuisinart Stainless fryer has 1,800 watts immersion heating element to meet all your frying needs. There is a one gallon of removable enamel coated oil container that has a pouring spout. This provides for easy changing of oil and straining the oil. There are three baskets, one large and two small heavy mesh baskets. The baskets have cool touch handles which makes it easy to remove food when it finishes cooking. With the three baskets you can cook different items at the same time. The handles are also collapsible which make storing easy. The Cuisinart Stainless fryer has a 30 minute timer and digital temperature control. This enables the temperature to remain the same even after food is added. The design is brushed stainless steel. There is a lid for viewing. 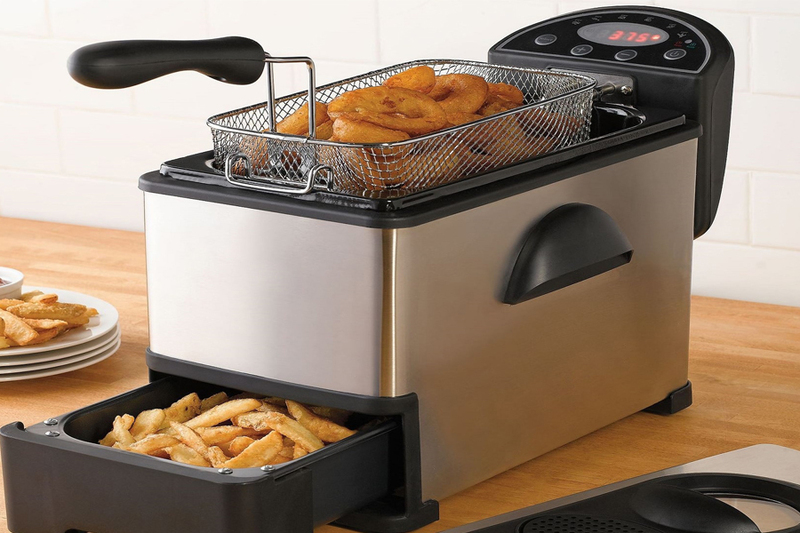 The Cuisinart Stainless fryer is large enough to fry meals for a large family. The small baskets allow you to fry smaller batches for smaller meals. Presto 05466 Stainless Immersion Element fryer is a professional quality deep fryer that is large enough to entertain, or feed a large family. Is comes in a sleek professional design that would look great on any countertop. 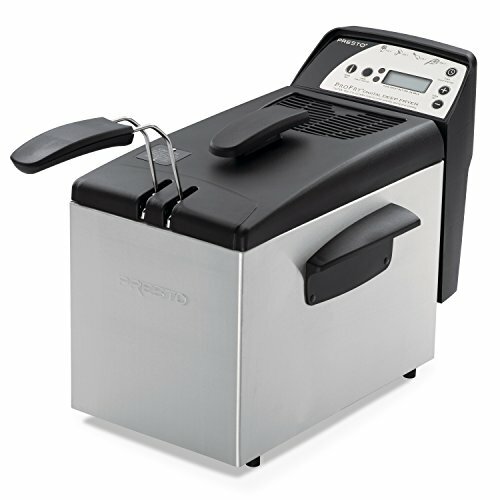 The Presto 05466 Stainless Immersion Element deep fryer comes with two oblong baskets that are large enough to fry large pieces of fish or chicken. The two baskets allow you to fry two different foods at the same time. There is an adjustable thermostat that maintains the oil temperature even after adding food. The Presto 05466 Stainless Immersion Element deep fryer has a 12 cup food capacity which is large enough for all your deep frying needs. The heating element and enamel pot are both removable for easy clean up. The Presto 05466 Stainless Immersion Element deep fryer is compact enough for easy storage while being large enough for large family meals. 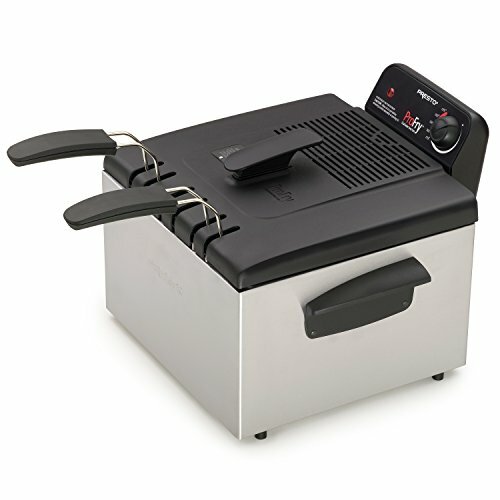 The Presto 05462 Digital ProFry Immersion Element deep fryer is a 9 cup single basket deep fryer. The small size is perfect for couples, individuals or small families. It’s sleek design and stainless steel housing looks great on any countertop. It also stores easily in any cabinet. The Presto 05462 Digital ProFry Immersion Element has 1800 watts of power which enables the deep fryer to heat up quickly and recover quickly when food is added. The oblong basket maximizes the cooking surface for larger pieces of chicken or fish. The Presto 05462 Digital ProFry Immersion Element has a digital display on the back of the unit for easy control. There is a 30 minute timer and an adjustable thermostat. This allows you to cook perfect food every time at the exact temperature you desire. The removable heating element and pot makes this unit easy to clean. There is also a filter on the cover. The Presto 05462 Digital ProFry Immersion Element also comes with a 1 year warranty.